The most dynamic ceiling storage solution around - the Surfboard Hi-Line. It's fully adjustable to fit your Surfboard and your ceiling space. The price fits your budget, too! 2 Nylon Straps - made of high-quality 1" wide, black nylon material to securely support your surfboard. Its soft webbing is gentle on your surfboard while stored. Metal Ceiling Mounts - sewn into both ends of each strap are heavy gauge D-ring clips that mount to your ceiling joists with included hardware to create the hanging storage system. Release Clips - each strap is equipped with a release clip that lets you "open" the strap, which is helpful when inserting and removing your surfboard from the storage system (see how it works). Adjustable Buckle - once your surfboard is inserted, it's easy to adjust the height of your storage by tightening or loosening the strap, like you would a backpack, and an attached "belt loop" secures any excess strap material. Adjustable Ceiling Storage. The Surf Hi-Line mounts to your ceiling joists and is an easy way to take advantage of unused overhead storage space in your garage, basement, or under your deck to store your surfboard. Even better, the Hi-Line is adjustable so you can customize it to your storage space! If you've got a high ceiling, you can keep the straps fully extended so your surfboard hangs down to where you can reach it. 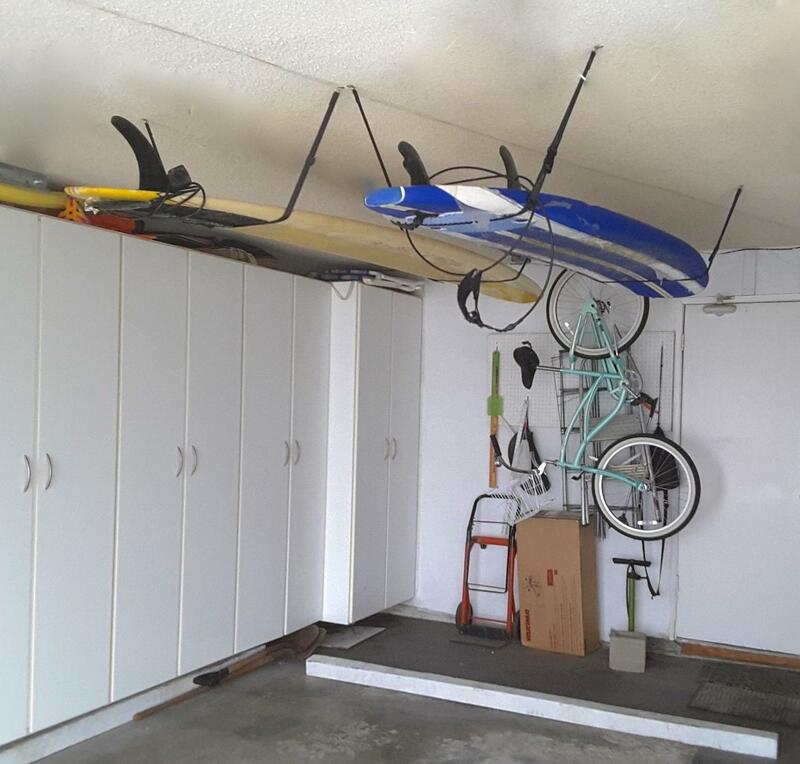 If you only have a small storage space (above your car in your garage, maybe) then you'll pull the straps so they're fully tightened to the point where your surfboard is flush against your ceiling (fins permitting). How Does the Hi-Line work? You'll mount each of the 2 straps to your ceiling and insert your surfboards so they're suspended by the straps. We recommend loosening the straps a bit so you can slide your surfboard in nose first, then pull the back strap under the rear of your surfboard and tighten the straps so the surfboard hangs as close or far from the ceiling as you want. To make it even easier to insert (or remove) your surfboard, you can unclip each strap "open" and clip it "closed" under your surfboard. That way you don't have to fit a "closed" strap around your surfboard and fins. What Surfboards will it hold? Weight: the Hi-Line is built to hold surfboards up to a total of 50 pounds. That's plenty of capacity for all types of surfboards - longboards, shortboards, and even paddleboards. If you've got lighter boards, you can stack multiple boards in the Hi-Line, too. Great for surfboards in travel bags as well. Dimensions: the Hi-Line can accommodate any lengths / widths / thicknesses, subject to your space. The metal mounting clips need to be mounted into ceiling joists (or rafters or studs), so your joists will dictate how wide you can mount the straps. For length, the 2 straps are independent so you can mount them at whatever length you need to fit your surfboard. You'll need clearance in your ceiling space for your surfboards (and fins). Also great for - paddleboards, kayaks, skis and more. Each strap can be adjusted from 34" to 96". Great for wider surfboards and to allow your board to hang down lower from the ceiling. New for 2016 is the Hi-Line! We designed this rack to be an adjustable, customizable ceiling storage solution. We know tons of our customers need to store their surfboards in overhead spaces, but rigid ceiling racks don't fit in all spaces and certainly don't fit all size surfboards. The Hi-Line will fit your space and your surfboards, no problem. Its heavy duty nylon webbing and D-ring mounting brackets can hold up to 50 lbs, ample for longboards to shortboards. Another great feature is the release clip. When I use the Hi-Line, I keep the back strap clipped open, then start by inserting the front of my surfboard into the front strap. I then push the tail of my board upwards (while front is supported by the strap) and clip the back strap together, closed under my board. This turns overhead storage into a 1-person job, no ladder required, whether it's putting my surfboard up, or taking it down. If you're really ambitious, you could set this up so your surfboard lowers directly onto your car's roof racks, making it one step easier. Hey, this is Andrew from StoreYourBoard.com. We’ve got a product video for all the surfers out there. It’s our Surfboard Hi-Line. It’s a very easy way to hang your surfboard from the ceiling. It’s affordable. It’s practical, and it’s a really lightweight storage solution. As you’ll notice, it’s a two straps-based system that you’ll mount to your ceiling. The straps come like this: two straps, unfolded will look like this. You mount them through two clips to your ceiling, flat end up against the ceiling, two clips with four included screws. It’s a very simple installation. The features of the strap system are that it’s adjustable, so almost like a surfboard car rack, same type of strap adjustability. So we have it hanging a bit further from the ceiling, we have a bigger storage space. If you have a smaller storage space, you can pull the straps, adjust it tight to your ceiling. It also comes with a release clip, which I’ll show you how it makes really easy to insert your surfboard into the straps. It also has two sizes. There’s an extra large, which is behind me. That’s an 8-foot long strap instead of two 8-foot long straps and then a larger size, which is two 4-1/2-foot long straps. Again, depending on the width of your surfboard and the storage space that you have, you can make the right selection for you. The last version that we offered is a cool-looking orange version. Maybe it matches your surfboard. It looks a little bit better in your storage space. Now I’m going to show you how easy it is to use. Here we have a 7’6-foot long surfboard in the Hi-Line. It’s already installed. I’ll show you how to get your surfboard out. I generally recommend leaving one side clipped, unclipping the backside where your fins are because it’s difficult to maneuver your board with your fins. Just get under it, tap the middle of that, and set your board aside, so you still got one strapped clip here, which you can adjust and then you have one clip open but you can adjust to any length. To adjust, pull it over the higher cord where your board is at. It’s just that simple. Also, to then get your surfboard back into the straps, I’ll leave the front clipped. Slide the front of your board in. Pull the straps under, slight adjustments, and you’re all set with the surfboard. This is rated for 50 pounds, so you got a 7’6-foot surfboard, it will be fine to hold that. You can get up to a longer longboard, and even if you got few more surfboards. We got another here, slide right in on top. Of course, this doesn’t have its fins in. If you have your fins in, you maybe flip the surfboard fins up and fins down, put something in between whatever it takes to get your storage solution looking like that for your surfboards. You got this great ceiling option, Surfboard Hi Line. Check it out on StoreYourBoard.com! I'm trying to figure out whether to get large or extra large surfboard overhead straps. Does the extra large condense down to the size of the large if I want to store it close to the ceiling or does it only go down to a certain size that would mean a regular surfboard would always hang down low? The XL Hi-Line is not going to get your board as close to the ceiling as the L version. The XL adjusts between 34" and 96" so is meant for larger/wider boards, SUPs, even Kayaks. If you are using it to store a larger board, you would want the extra length. The Large adjusts between 13" and 54" - so works for smaller boards, or if you don't have that much clearance (say above a door or a car) and want the board up as close as possible to the ceiling. In most cases, for a regular size surfboard, large should be fine. What is the difference between your Surfboard hi-line vs SUP hi-line storage? XL: each strap can be adjusted from 34" to 96". Great for wider surf or paddleboards and to allow your board to hang down lower from the ceiling. Can I use one set of straps for 2 boards? These hi-lines can work for more than one board, as long as their total combined weight is no more than 50 lbs. Could I use these straps to hang my surf board from a garage storage rack instead of the ceiling? Our Hi-Line Surfboard Hanger needs to be mounted to wood ceiling joists with the included installation hardware. It would not work to hang them off a utility rack, they would not properly or safely support a board that way. 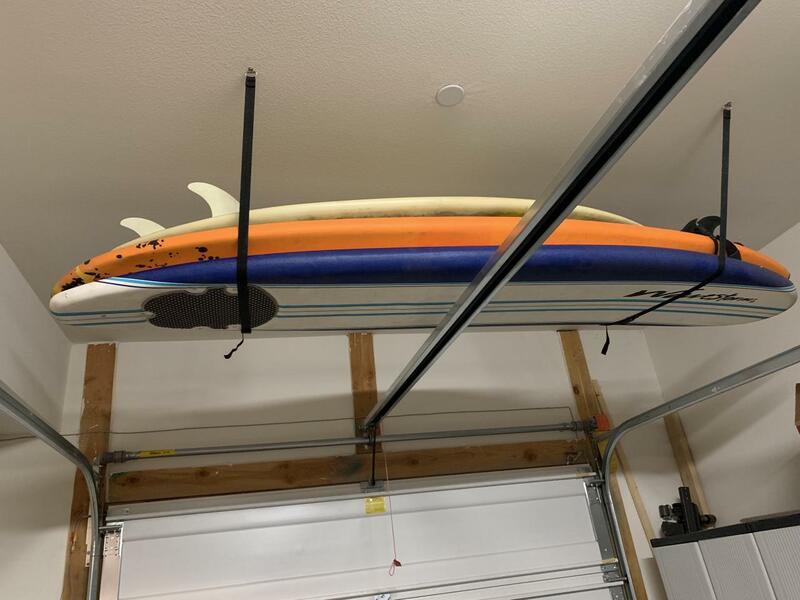 Hi, I am looking at the Surfboard Hi-Line Ceiling Surf hanger -- I was wondering if the price is for two of the straps? Yes - the price is for a complete set of this surfboard hanger! 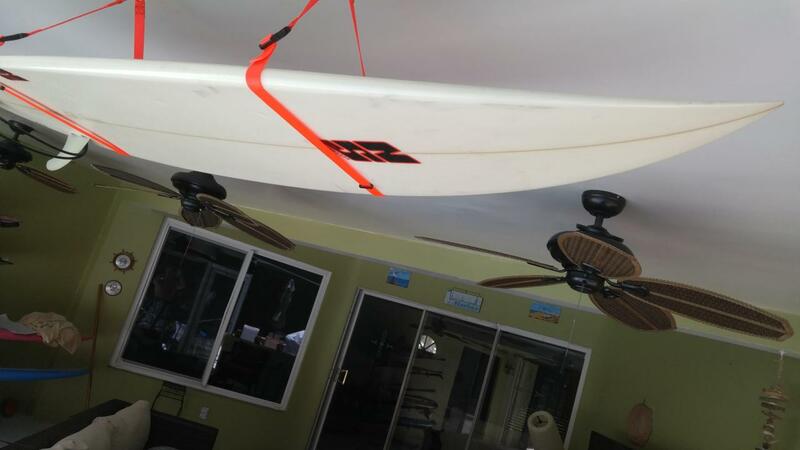 With our Surfboard Hi-Line system, you can get your board very close/flush to the ceiling. You just tighten the straps to raise the board up higher. The straps that hold the board adjust between 36" and 96" -- but those measurements are not exactly how low the board will hang, as the straps are going around the width of your board, so that uses up some of the overall strap length...but ultimately, you have a lot of flexibility in how high (or low) you want to store the board, and it can work in tight spaces to get a board next to the ceiling. We bought this to save space in keeping our garage neat. Our surfboards needs to be kept where they can't be damaged. There's a space in between our ceiling and the garage door rails. This hanger was perfect. Installation was easy. I used a stud finder and a drill to screw the strap in the ceiling. I highly recommend. I realized that I couldn't buy the materials here at a hardware store and make this myself for this price, so I bought it without a second thought. Installation is easy if you have a stud finder. I am finding, however that I am going to have to change my location since one of my longest boards will interfere with my garage door where I have placed it, so be sure to place it where nothing conflicts. I placed my screws about 3.5' apart in the short direction and about 6' apart in the long direction. When I re-do it, I may change the short direction to 4' so that the bottom hangs a little higher. Great product, easy to install and works great!! This is my second purchase of 2 hangers. It works perfect to get the boards out of the way but easy to get them down and put them back up. I put this up in a couple of hours. I did buy a little better screws that I could use a wretch on and not have to rely on a screwdriver to put the screws in the ceiling. It holds the longboard very well. Gets the board out of the way. Good product. Bought 4 pairs of the long size Hi Line surfboard hangers to hang 3 surfboards and one snowboard from the garage ceiling. They work very well! Very easy to install, worked very well with my 11ft stand up paddle board and holds it out of the way of everything. Highly recommend. Great product for a great price. All supplies included for install. Ordered shorter straps and relealized quickly they would not work. My wife called and without question your staff put longer straps in the mail to us. It was such an easy and effortless transaction and installation was a breeze. My garage has never looked so clean and organized. This product is super easy to install. It only took me about 10 min. to put it up. The instructions are easy to follow, although you probably could figure out how to do it without them. As the picture shows, you do need to have a stud or joist to attach it to. It is also a very economical way to store you board out of the way. I would recommend this product, but again, you do need the right spot to install. The toughest part was finding the studs. I love getting the boards out of the way. I will see how it goes with my granddaughter learning how to get the boards down and up. Ordering was easy. Delivered within two days. Product worked perfectly.